An intricate look at the outsized role of a group of Chesapeake Bay, Virginia, families in the dangerous work of the Merchant Marines during World War II. As former Richmond Times-Dispatch journalist Geroux delineates in this stringently researched study, the Merchant Marines “was not a branch of the military” but rather “an association of privately owned shipping companies operating under the American flag, employing American crews, and fighting like bull sharks over contracts to haul goods by sea.” Thus, they became vitally important in control of the seas when war broke out officially in 1941. Mathews County, Virginia, had a long reputation for producing the most capable mariners, and Geroux spotlights several families whose fathers and sons took the brunt in parrying the German U-boats that hunted in the waters of the Atlantic, Caribbean, and Gulf of Mexico, disrupting war supplies and oil to Britain and Europe. The author delves into the service of the Hodges family of Gales Neck, whose many sons became merchant mariners, working as independent contractors for the U.S. government who needed to carry the crucial war cargo across the seas. Facing the ramped-up U-boat campaign in the beginning stages, the U.S. did not have the wherewithal to protect the tankers and freighters—until the implementation of the convoy system in mid-summer 1942 after horrible losses at sea such as the sinking of the Onondaga. Geroux offers poignant accounts of these lost men, such as Onondaga’s Capt. George Dewey Hodges, whose remains and ring were soon after found in a captured shark. Sadly, however much the Merchant Marines aided in helping shepherd the convoys across the seas during the war effort, they were locked out of the postwar veterans’ benefits. 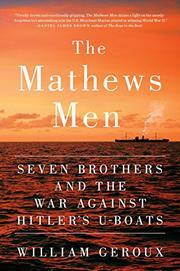 A deep, compassionate group biography of these “unsung heroes” of the Merchant Marines.